Beloved Women of the world... I can't be more happy for the year we're stepping in and the energy that awaits us. When I read this energy forecast for 2018 I was jumping, laughing and flying from happiness. What a GIFT. What a message for all of us to remember about our feminine strength and keep developing it. 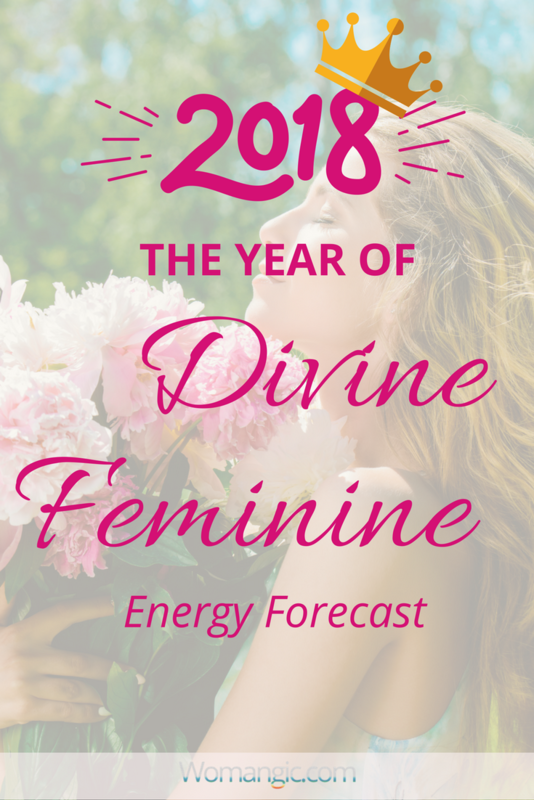 It is OUR time, it is a year of divine Femininity! If you've been with me for a while, you probably know why I was soooo happy. And if you're the first time here, let me elaborate. Womangic is all about unleashing a divine gift of femininity in sensitive, driven, wholehearted women of the world. We do it through meditation, online education and shifting the negative beliefs and ideas we have about us as a woman. Here is the detailed Energy Forecast by Emmanuel Dagher. 2018 is the Year of the Feminine, and this will impact all of us in a big way. In 2017, we saw many seeds planted in regards to the shift in power coming in 2018. Before we dive further into what 2018 has in store for us, it’s important to get an aerial or expanded view of what’s happened overall in the past decade. From 2007 to 2016, a quantum leap in consciousness occurred that affected every area of life, from science, innovation, and art to personal and global awakening. It’s as if the curtains were being pulled back, allowing us to finally see beyond the veils of illusion. People from all walks of life started noticing their consciousness expanding into new ways of thinking, living, and being. They also noticed that time is speeding up, and that the world is shifting like never before. Meditation has become mainstream, and is being used as a powerful tool of healing and transformation. Not only in people’s personal lives, but in the workplace, health-related organizations, schools, and beyond. A decade or more ago, if you had told someone who wasn’t familiar with the mind/body/spirit community that you were meditating, well—you probably would have seen a blank, glazed look in their eyes, at best. The demand for organic and non-GMO foods and products is so high, that the supply can barely keep up. New farmer’s markets and health-oriented stores and restaurants are opening up everywhere, creating options for people to take good care of themselves, from the inside out. People are realizing that they can no longer give their power away to institutions and organizations such as religion, government, or any of the old structures that promote suppressive, fear-based agendas. Of course, there’s still room for improvement in that area, but the past decade has seen a huge shift in a new direction. Caring for the environment has become a priority like never before, with people beginning to create new ways of living that are more beneficial for our planet. The consciousness of humanity as a whole has evolved beyond the old patterns of separating ourselves from one another. People are looking beyond the color of each other’s skin, gender, sexual orientation, or cultural background, and are connecting through the knowing that we are far more alike than our ancestors may have believed. Again, there’s always room for improvement. Yet the big strides are taking place, and shifts are happening everywhere. You may have noticed that people are becoming friendlier to the idea that we are not alone in the Universe(s). Every few months, we hear about an “Earth-like” planet that has been discovered in a far-off galaxy that “could” be the home of other civilizations. Of course, our indigenous cultures, and the current Wayshowers and Lightworkers, have known for a long time that these civilizations exist. But it’s nice to see the idea making its way back into the mainstream Western consciousness. Western medical practices are more and more acknowledging and integrating with natural and holistic approaches and methods of healing than ever before. There’s also a great deal happening in the areas of technology, creative arts, and personal well-being. But the examples offered above offer a clear picture of how quickly we are evolving. To many, 2017 felt like a year in which much of the progress that was made in the last decade took a backward turn in the direction of the old fear-based paradigm. Again, from an aerial view, there’s always a blessing in every experience, even if that experience feels challenging or doesn’t seem to make any sense at the time. In the case of 2017, the entire year served as a “reset” button. Imagine you have a fairly new computer that you leave on day and night. During the time you are working on the computer, you create, read about, and save lots of helpful, uplifting, and consciousness-expanding content. However, at one point you notice that the computer is processing a bit slower than usual, because it has not been shut off for a while. So, you decide to turn it off to let it rest. The next day, you turn your computer back on. It now works like it did when you first got it, and … you still have all of the great content you had saved prior. Now that the computer is working faster again, you can create, learn about, and save even more helpful, uplifting, consciousness-expanding content to enjoy. 2017 was like that. It gave us a needed reset, a time to put into perspective what we truly desire to create or enrich our lives with now—and what we are ready to completely release. It was an eye-opening, often head-scratching year for many, yet it shined a light on many of the shadow aspects of humanity that still needed healing. For that, as challenging as it was, we are grateful. Because what it did was pave the way for something far greater to emerge. The calls for the Divine Feminine were strong, and She is set to come back in the year 2018, a “2” year. She has heard our calls, and is roaring her way back as the sacred mothering lioness that she is to all of us. The Divine Feminine is preparing to carry us all the way to our new paradigm on her energetic wings, and nothing can hold her back her anymore! 2017 was two steps back, yet 2018 will be thousands of steps forward. In 2018, the Divine Feminine seeds that were planted in the Summer of 2017 will blossom fully, and command our full attention. The power that comes with this Year of the Feminine will be like none other in our recent history. The closest time this much Feminine energy came in was in the late ’50s. What followed was all of the advancement that took place in the ’60s. This is the year that the Divine Feminine makes her presence felt more than ever in the heart, mind, and experience of every being. For those who resist or intentionally decide not to embrace, honor, and respect the Divine Feminine, 2018 will be a challenging year that will continue to pull them onward, until they are able to embrace, honor, and respect the Feminine energy. The Divine Feminine is often associated with soft and gentle energy, although that is only one small aspect of the qualities that represent Her. The Feminine energies making their way into our consciousness this year will be bolder, louder, and more powerful than ever, requiring justice, fairness, and freedom in all areas of life. This is the energy of this new year: Enough is enough, and now something is finally going to be done about it. 2018 will feel more like the beginning of the new era that many thought had started in 2012. The winds have shifted direction, and the core foundations that our world has been operating on are being rewired to make the Divine Feminine the core foundation of everything, as She was originally meant to be. The “reset” we recently experienced was an integral part of our journey, and made absolutely clear what needs to be changed. And 2018 is the year it WILL be changed. It doesn’t matter whether you are a woman or a man. Give yourself full permission to embrace, honor, and respect the Divine Feminine within yourself and others, and it will be reflected back to you many fold. In 2018, we will see many more women and men who are fully embracing, honoring, and respecting the Divine Feminine step into roles and platforms that have them serving as leaders. This can be in local communities, businesses, and all the way up to the global stage. Many voices around the world will shine a light on the importance of unity, compassion, and healing. Voices like this, which were once silenced, will continue to take center stage, and will help to usher in a more heart-centered world that benefits everyone, rather than a select few. Selfishness, control, ignorance, and greed in the collective will find it very hard to survive in 2018 and beyond. The Divine Feminine will be cleaning these qualities up from the heart and mind of humanity. The more love and kindness we choose to embody, the easier this process will be. This year gives us the opportunity to honor our emotions in a loving way, and to allow them to fully be expressed so that they can heal out in the open, rather than keeping them buried deep inside. Once our emotions have been expressed inway that is productive and healing, they can be released from our body, where we can be at ease with ourselves. Dis-ease manifests when someone is not at ease, due to holding stress in their body. The way to be at ease is to pace ourselves, not rush all the time, and to listen to our intuition and body. This is also the year that we will be given the ability to learn how to release the need to attach ourselves to the seeming global occurrences that are promoting fear and separation. This will be big, because it will allow us to not get distracted or held back from living our best life in each present moment. One thing that will help tremendously is to cut back our media time (phone, TV, news, internet) and spend time being in Nature, seeking spiritual enrichment, and spending time with the people we love. 2018 is also a great time to embrace big changes such as having a baby, taking care of a new pet, moving to a new home, traveling, rekindling a relationship or starting a new one, and starting a new business venture. This year also provides us with the gift of bettering the human experience for all. So kindness will be a big theme, along with anything that promotes the betterment of the human experience for all. Our educational system, our values and behavior, our relationship with Nature, our health and well-being, and how we are treating one another, are all things that will be focused on and improved this year. As we continue to connect with the Divine Feminine throughout this new year, we will discover and allow aspects of ourselves that are increasingly empowering and freeing. These new strengths can include greater kindness toward ourselves and others, more creativity, and spiritual strengths, such as the ability to forgive what we may have resented in the past. They may include the desire to flow easily with the day’s events, to live more in the present moment, and to see the joy of life, not only the responsibilities of it. If you have been desiring a flowing, joyful, fulfilling life that allows you to be more fully who you are—2018 will be a life-changing year for you! The Divine Feminine is calling us up into wholeness, lightness, inner knowing, and a feeling of connection to all Life we never knew was possible. Thank you for reading, hope it inspires you as much as me!